No Waiting for Regular Shared Cruise Port taxis to fill up. For Havensight arrivals, driver will meet you at Gate 3, right beside the blue canopy that says Pre-Arranged Tours Pickup. For Crown Bay arrivals, driver will meet you at the Windmill. This service must be booked in advance. It is not available to book at the port. 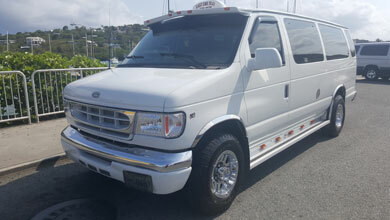 Go anywhere from your St Thomas Cruise Port, Havensight Dock or Crown Bay Marina, with a private non-stop taxi service! Your driver will provide you with a quick and direct stop at your choice of beach, landmark, or ferry dock if you are trying to make it to St. John for the day. We offer one-way or round trip cruise port transportation from Havensight or Crown Bay and we also service the Red Hook Ferry Dock as a destination. Enjoy a smooth ride in your private vehicle, serviced by CaribbaConnect with timely pick-ups and drop-offs. Our St Thomas cruise port transfers are ideal for groups of 4 or more as the public shared taxi available at the port costs $12-$15 per person on average to get anywhere while the private transfer costs $15 per person with a minimum of $60 which is the price for 4 people. The number and type of vehicles are assigned based on the size of your party and availability, and all of our drivers and vehicles are fully licensed and insured. Best of all, unlike St Thomas cruise port taxi services that make you wait until their taxis are full, there is NO WAITING FOR OTHER PEOPLE with our service. Use our easy online form to check availability and book your cruise port transportation now! Note: Private Cruise Port Transportation can only be booked in advance. This service is not available to book at the cruise port. Perfect for Groups of 4 or more! Service must be canceled within 48 hours of your scheduled pick-up. If your cruise is canceled or no longer coming to St. Thomas, please contact your driver to reschedule or cancel service and receive a refund. If you booked a roundtrip, you may only cancel 48 hours prior to the first leg of the trip. As a roundtrip is considered one service, you may not cancel any individual part of a roundtrip. All contact details provided upon confirmation of your booking.